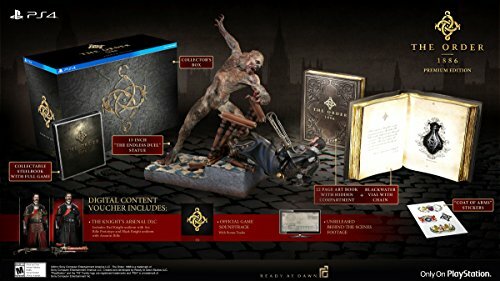 Amazon.com Price: $199.99 (as of 2019-04-22 02:41:45 GMT) Product prices and availability are accurate as of the date/time indicated and are subject to change. Any price and availability information displayed on Amazon.com at the time of purchase will apply to the purchase of this product. Set in a rich, detailed world that fuses real historical figures and events with new fictions and twists on familiar myths and legends, The Order: 1886 presents a unique vision of Victorian-Era London never seen before. In this alternate history, a dangerous foe known as Half-breeds emerged centuries ago. In response to this new threat, an elite order of Knights formed to protect humanity from this deadly threat. Strengthened by a mysterious liquid called Blackwater, the Knights of The Order are able to heal their wounds and extend their lifespans in order to engage this supernatural foe. While the Half-breed threat is pushed back into the shadows, a rebellion emerges that threatens an already unstable peace. Tight security measures that amount to a near police state, combined with a widening gap between the rich and the poor, have left the citizens of London angry at those they perceive to be the cause of their woes. The Rebels’ ranks are growing, as is their boldness, as they declare an all-out war against The Order and the government oppression it represents. Now, the Knights of The Order must face threats on all sides as they struggle to maintain peace and order. Assume the role of Galahad, and engage both Half-breed and rebel as one of the most experienced Knights of The Order. Armed with a deadly array of advanced weaponry, utilize the third-person view and expansive cover system to float in and out of cover as you hunt your enemies. Fire bolts of electricity to take out long-range targets with the Arc Gun, or rain down fire on enemies with the Thermite Rifle by dousing them in a cloud of flammable dust and igniting it with a superheated flare. The weapons of The Order: 1886 are all based on plausible science and technology. Advances in technology have also helped The Order patrol the city and keep its citizens safe. Airships patrol the skies and are a constant reminder of the police state that controls Londoner’s lives. Every member of The Order wears a wireless device to communicate with each other and the airships that patrol the skies. A variety of gadgets aid them in the work, such as the monocular that allows the Knights to see across great distances, signal airships via Morse code and more. Immerse yourself in the gritty world of The Order: 1886 through the stunning, cinematic presentation made possible with realistic lighting and rendering techniques and a visual presentation that mimics the nuances and imperfections of actual motion picture cameras and lenses. The dirt on the camera lens, the dust in the air and the light passing through broken and boarded-up windows all make for a more realistic and believable presentation. The cinematic experience is furthered by the deep, sophisticated narrative, featuring full performance capture for characters and scenes. Seamless transitions between action and story sequences work together to bring the rich narrative, rife with conspiracy, intrigue and betrayal to life. You play as Galahad, an expert tracker and hunter whose instincts and skills, developed over the years fighting Half-breeds, are legendary among members of The Order. Jaded and numb to the violence he witnesses day to day, Galahad is world-weary with a calm, cool, professional demeanor. Protégé of Malory and mentor to Isabeau. Sir Percival is a mentor and long-time friend to Galahad, and one of the few Knights who can match Galahad’s strength and ability. One of the eldest Knights in The Order, he commands everyone’s respect and is ready to work outside the bounds of the law when a situation calls for it. Under the tutelage of Galahad, Lady Igraine became the youngest member to ever be inducted into The Order. Now, as one of their most skilled and headstrong Knights, both she and Galahad share a mutual respect for each other. Recruited for his tactical genius honed during the American and French Revolutions, Lafayette serves as Sir Percival’s apprentice and has become an invaluable member of his squad. At times impetuous, his passion for freedom and liberty is only equaled by his love of women. The Order: 1886 takes place in a painstakingly recreated Victorian-Era London, which features familiar places such as the Palace of Westminster, Mayfair, Whitechapel, the Crystal Palace, Big Ben, and the London Tube. But take a closer look. This alternate vision of London features new advances in technology brought about by an accelerated Industrial Revolution and the centuries-old conflict between Human and Half-breeds. Giant airships patrol the London skies and electric trains traverse the city on elevated tracks above busy streets. Amid this alternate history, The Order remains a pivotal part of the kingdom with its council hidden deep within the halls of the government’s seat.